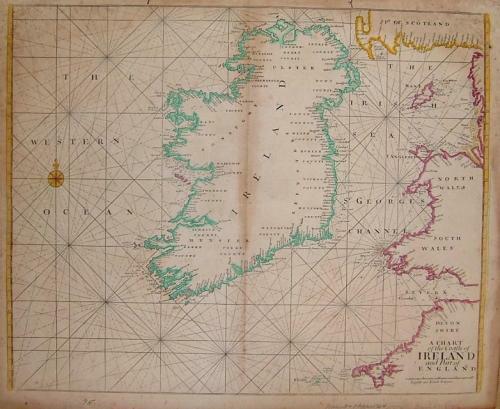 Title: 'A Chart of the Coasts of Ireland and Part of England'. Possibly from an Edition of Part #1 of 'The English Pilot'. In very good condition with no tears or holes. There is the usual fold seam at the center. Some browning has occured at this fold from the center to the top. There is browning/spotting at the top two corners that goes slightly into the map area. The margin area has browning / spotting around the outer edges. There is a "y" shaped hole impression at the top...apparently from when it was folded in the atlas.